This book is a rare piece of work of 22 years of experience of the author in the field of astrology and numerology. This book is for the lovers of astrological science and astrologer. In this book the first part speaks about significations of planets, signs and houses in a elaborated way. 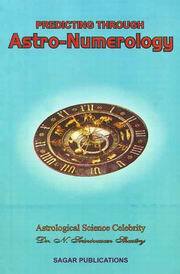 The specialty of this book is formulas in astaka varga system of timing of events, with which readers or astrologers can get exact (month and date) timing of events. In this book readers can also find the ways of judging horoscopes by using both astrology and numerology. Lastly in this book given are the "Hora" hourly astrology for day to day questions, and each question is provided with 2 types of calculation methods and 2 types of Thum Rules both astrologically and numerological. This book is a handy book with complete astrology for astrologers and learners of astrology. The main motto of the author in his book is to find an astrologer in every reader. Surely the best and pin-point predictions!